"If you don't know where you are going, look back to where you are coming from". With my music I invite you to cross borders through a common human understanding in combining the traditional with the modern world. You will gently float on a journey between my griot heritage and the questions of the global world of today. "You don't become a griot. You're born a griot". I was born into a large and famous griot family - both on my mother's and father's side. I was raised in the yard of Cissokho Kunda. Since early childhood I was exposed to an ambience of constant learning of traditional instruments (such as the kora, djembe or balafon) and dance. Further I grasped as well the deep rooted spoken word - including all ancient proverbs and sayings of the oral tradition of mandinka culture. My cultural background therefore can't be traced to one single event when my studies started - I absorbed this musical heritage with the breast milk, so to say. My talent was recognized by the National Ballet of Dakar where I got admitted to at the age of 14. From that moment on I toured in different cities in Senegal and in different european countries. Since 2011 I live in Austria where I continue following my musical passion. To this day, I play in different bands of my own as well as with Veronika's Ndiigo. Later on my musical journey brought me to Jan Galega Brönnimann and Omri Hason, with whom I toured in and outside Switzerland. 2016 we released the CD "al nge taa". My personal inspiration is my grandfather - the famous Soundioulou Cissokho who toured already back in 1948 through Europe and Africa with the well-known panafrican Ballet of Keïta Fodéba from Guinea. My grandfather was often referred to as the "King of Kora" because of his virtuous approach of playing traditional songs and combining them with contemporary music. "The real voyage of discovery consist not in seeking new landscapes, but in having new eyes". Music is communication. It allows a dialog between two souls, regardless of the cultural background. With my rhythm, my tunes and my song texts I invite the careful listener to travel, see and feel the treasures of a magical musical world. My musical inspiration and famous heritage can even be traced back some centuries to Fakoly and Soundiata Keïta (born 1200 A.D.). This solid traditional fundament allows a gentle way of interweave the past with the present. 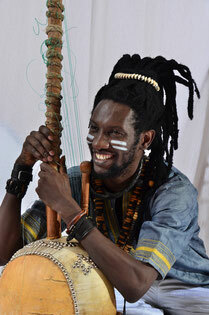 My open musical approach can be seen in integrating african instruments (such as kora, percussion, balafon) with european instruments (such as cello, violin, saxophone, guitar). 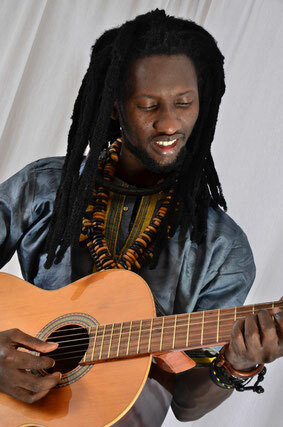 With my music I am always on the search of combining the kora music with different musical styles and allowing a natural communication between senegalese mbalax or acoustic music to a more classical style just to find roots as well in a folkloristic or jazzy groove. The content of my songs are a search for a truth. My duties as a master of word ("Maître de la parole") is to name society relevant subjects and to enlarge people's minds. My song texts are subtle statements in the art of the rich oral tradition, pointing out the unseen through proverbs or poems. 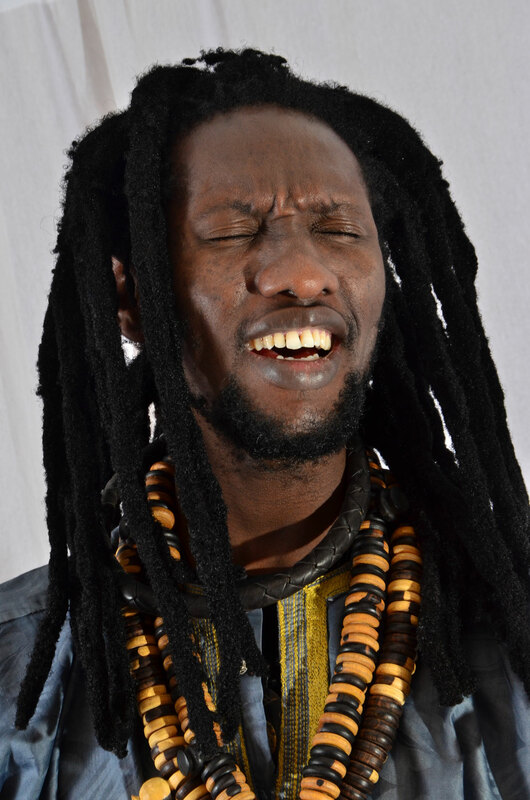 As I understand myself as a nomad, I sing my songs in Wolof and Mandingo, French, English and German. 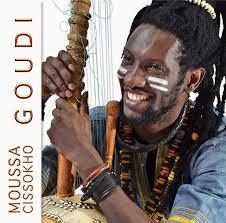 free download / CD "Goudi". Prince Moussa Cissokho with: Veronika's Ndiigo. feel it all. 2014. 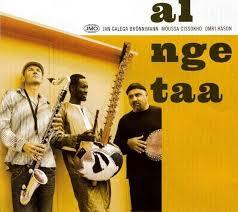 Jan Galega Brönnimann, Moussa Cissokho, Omri Hason. al nge taa. recorded 2016 at the zoo, Bern/Switzerland.